During final registration on Friday night, St. Thomas’ Ruth Ann David said her goal was running under 1 hour and 30 minutes, a time that would demolish the four year-old Deloitte-Ogier BVI Sunrise Half Marathon women’s course record by four minutes, in the race was presented by the BVI Tourist Board and the BVI Athletics Association. On Saturday morning, while counterpart and defending champion Shane DeGannes—the only 3-peat winner in event history—saw his streak snapped, David, who came within .10 of Meriel Stedman’s 1 hour 34 minutes and 09 seconds in 2012, went out hard then charged home in 1:30.46. 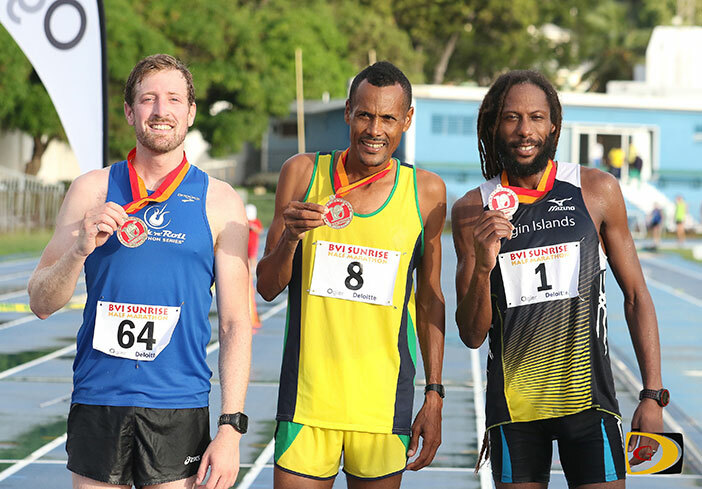 DeGannes controlled the race for the first half before St. Vincent and the Grenadines’ Pamenos Ballentyne made his move and went on to win in 1:19.18. It was the fastest time since 2010 when Ballentyne was third in 1:09.50. DeGannes finished second in 1:24.09, followed by Virgin Gorda resident Vincent Fouriner in 1:24.19. DeGannes said he welcomed leading Ballentyne in the first half and welcomed chasing him in the second half. Race director Kay Reddy who has run in all ten editions said the event is growing and was happy with how things went. Race founder Simon Cook who was 15th overall in 1:44.20, described the race that had 141 participants 89 of them as individual entrants the others on relay teams, as ‘absolutely awesome’ and it was great to see so many people out. When told his vision live on, Cook said apparently it does. Final Results. Men: 1. Pamenos Ballentyne, 1 hour 19 minutes and 18 seconds. 2. Shane DeGannes, 1:24:09. 3.Vincent Fournier, 1:24:19. 4. Reuben Stoby, 1:26:58. 5.Julius Farley, 1:29:12. 6. Guy Williamson, 1:31:05. 7. Rodrigo dos Santos, 1:35:18. 8. Ian Montgomery, 1:36.56. 9. Alexander Dale, 1:37.37. 10. Jacques Roux, 1:37:46. 11. Curwin Andrews,1:38:54. 12. Simon Cook, 1:44.20. 13. Michael Killourhy, 1:47:13. 14. Ishwar Persad, 1:48:58. 15. Richard Morgan, 1:50:15. 16. Michael L Sheesley, 1:51:04. 17. Garbriel Obregon, 1:51:40. 18. Russell Crumpler, 1:51:50. 19.Adrian Dale, 1:52:15. 20.Claude Walker, 1:52:47. 21. Adam Holdt, 1:53:46. 22. Shaun Reardon John, 1:54:03. 23. Shane Donovan, 1:55:34. 24.Adam De Monte, 1:57:04. 25. Christopher Farmer, 2:00.38. 26. Daniel Mitchell, 2:03:16. 27. Guy-Paul Dubois, 2:03:30.28. Ray Wearmouth, 2:08:38. 29. Jonathan Addo, 2:10:13. 30.James Drury, 2:12:13. 31. Dennis Versos, 2:14:29. 32. Dr. Garfield Neita, 2:19.06. 33.Jim W. Cullimore, 2:34:11. 34. Howard Moore, 2:38:31.35. Liam J. Hardie, 2:44:34. 36. Bill Kinkead, 2:48:05. Women: 1. Ruth Ann David, 1:30:46. 2. Katrina Crumpler, 1:39:30. 3. Kim Takeuchi, 1:44:50. 4. Rebecca Paul, 1:45:56. 5. Maria Mays, 1:46:34. 6. Rosmond Johnson, 1:48:04. 7. Caitlin Goodwi, 1:51:54. 8. Rachael F. McDonald, 1:52:34. 9. Melissa Brunner, 1:52:49. 10. Katy Allen, 1:52:58. 11. Jenny McIvor, 1:53:29. 12. Ami Sweeney, 1:55:20. 13. Gillian Plaxton, 1:55.56. 14. Tameka Davis, 1:57:08.15.Claudia Ferrari, 1:59.19. 16. Kay Reddy, 2:01.01. 17. Lauren Julien, 2:01.29. 18. Ni MadeOniasih, 2:03:04. 19. Anna M. Kinkead, 2:04:54. 20. Judith Haycraft, 2:05.21. 21.Elaine McCann, 2:06.52. 22. Sarah Hayes, 2:07.20. 23. Marianne Cave, 2:08.27. 24. Deborah Bell, 2:08:35. 25: Kerry-Ann dos Santos, 2:09:04. 26. Natasha Ruscheinski, 2:09.04. 27. Chloe Harris, 2:09.25. 28. Melisande Rowe, 2:11:36. 29. Rhiannon Jones, 2:13:13. 30. Camille McCutcheon, 2:16:00. 31. Laura Dore, 2:21:56. 32. Clair Burke, 2:24:30. 33. Debbie Ridgeway, 2:26:08. 34. Natasha Gunney, 2:27:00. 35. Karrina Stead, 2:37:38. 36. Barbara O’Neal-Rhoden, 2:42:09. 37. Nedy Ador Dioncio, 2:46:55. 38. Jenny A. McConnell, 2:50:16. 39. Shirley Liburd, 2:50:22. 40. Jill Farley, 2:57:50. 41. Amber Walker, 3:05.04. 42. Lisa Brown, 3:30.00. Men: 1. Steven Bridson, 2:50:35. Women: 1. Linda Li, 3:12:35. 2. Sophie J. Bennett, 3:12.40. Harneys 1, (Gregory Boyd, Ian Montgomery, George Weston), 1:49:41.69. Grant Thornton (Sam Ouriach, Paul Frey, Simon Cross), 1:58:10. Appleby Adam and the Ants, (Adam Holdt, Judy Haycraft, Andrew Willins), 2:00:13. Harneys 2, (Jessica Brodrick, Natalie Bell, Macia Payne), 2:02:32. Team Krys, (Robert Shiffman, Sean Cordes, Sarah Duncan), 2:03:46. KPMG Spartans, (Stephen Langford, Lucinda Ford, Lovat Carnelly), 2:08:07. 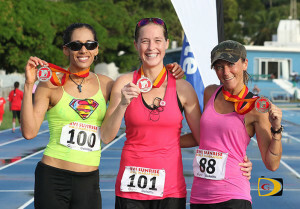 Deloitte 1 (Dylan Bobb, Tia Beckmann, Sophia Addas), 2:09:02. Deloitte 2 (Aurelie Legagneux, Shevon Williams, Maria Kristina Balangatan), 2:15:10. Team Carey Olsen (Sharon Mungall, Rachael Matthews, Andrew Chissick), 2:22:07. BDO Binder (Jovan Van Heerden, Ryan Geluk, Florencia Taray), 2:36:22. Harneys 3 (Shonda Alfred Leacock, Rahel Worede, Richard Parchment), 2:37:17. KPMG Formidables (Catherine Jackson, Kerry George, Khoyisha Stoutt), 2:56:51. Tek Dat, Marvin Flax, Julien Johnson, Chris Farmer, Barbara Pinnock-Smith, 1:52:00. Team Elizabeth Ricardo, Richie Paul, Jules Potgeiter, 1:55:50. Team Guy-Paul Dubois & Dara Smith, 2:07:39. Team Jenni Dobbie and Zoe Bickerton, 2:18:02. Team Katie Morley & Katalin Harmat, 2:21:09. Team Brodie Faragher and Sofia Fay, 2:28.24. Cedar Grade PTA (Anna Kinkead, Rhiannon Jones, Garfield Neita), 6:39:13. Spirit of the Event – Team USVI. Best Water stop – Sensus/BVI Tourist Board.